The BBC Music Awards, celebrating the year's best popular music, has been launched by the corporation as part of a wide-ranging musical strategy. 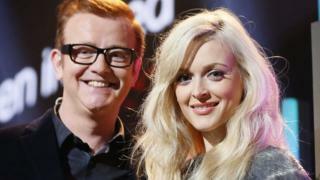 The awards will be the BBC's biggest musical event after Glastonbury, uniting BBC One, BBC Radio 1 and BBC Radio 2 ahead of a live show with Chris Evans and Fearne Cotton. The event will be held on 11 December at London's Earls Court. The awards will also feature a host of performances to review the year, as well as collaborations between well-known artists and the BBC Concert Orchestra. "Today's the start of something very special for everyone who loves music," BBC director general Tony Hall said. "BBC Music is a celebration of the brilliant musical talent across our country. We'll be joining up music on television, radio, iPlayer and online like never before. There'll be new shows, new partnerships and whole new ways to enjoy music." Genesis: Together and Apart (BBC Two) - reuniting the band members for a feature-length documentary which profiles the rock band. The Soundtrack of the Twentieth Century (BBC Two) - capturing the history of pop music over the past 100 years. Country Legends: Nashville and Beyond (BBC Four and BBC Radio 2) - season of programmes exploring the history of country music. Reginald D Hunter's Songs of the South (BBC Two) - three-part series which sees the Georgia-born comic on a road trip through 150 years of American popular song. T in the Park, Reading and Leeds festivals (BBC Three). Oh You Pretty Things! (BBC Four and BBC Radio 6 Music) - three-part series examining the relationship between British rock and pop music and fashion. York Early Music festival and productions from the Royal Opera House's 2014/15 season (BBC Radio 3). Subject to BBC Trust approval, BBC Radio 1 will launch a branded space within BBC iPlayer featuring Live Lounge performances and big guest interviews. Exclusive content from Glastonbury, Reading and Leeds festivals with full sets available on demand for 30 days. Further development of BBC Playlister, offering personal playlists form BBC presenters and programmes and the ability to export audience playlists to the music providers of their choice. Ten Pieces - new initiative for primary schools aiming to inspire a generation of children to learn more about classical music. lead by BBC Learning, BBC Orchestras and BBC Singers. BBC Introducing - announcing a new partnership with the National Skills Academy to develop the technical and production skills of the future; adding two new showcases in the US, co-funded by PRS for Music Foundation, to offer new artists the opportunity to be seen and heard. "From the BBC Proms to Glastonbury, music on the BBC already creates a range of amazing experiences that our audiences love," Bob Shennan, director of BBC Music and controller of BBC Radio 2, 6 Music and Asian Network, said. "Under BBC Music and in partnership with the UK music industry, we will set a new benchmark for quality and scale, with bigger events and more world-class programming delivered in new ways." Lord Hall said the implementation of the new music strategy was not being undertaken by the BBC on its own. "This is the BBC working in partnership with lots and lots of like-minded people. It's always struck me that all of us in the arts and BBC have an interest in the next generation," he said. He added the plan was a good use of the licence fee: "We are doing this on the basis of our existing resources - we haven't got any extra money. "What I learnt from running the cultural festival for the Olympics, is that if we put in a pound and somebody else puts in 50 pence, and someone else puts in 20 pence, and somebody else a pound, you can have a much bigger bang than just when you stick to your own money. And that's what I think will happen with this."